Just to clarify the terminology, output refers to a country’s real gross domestic product (GDP). Because real GDP is adjusted for the changes in inflation (in other words, it has no price effect in it), it can also be referred to as output. The relationship between exchange rates and output, usually the percent change in output (in short, growth rates), is used. Some of the exchange rate determination theories, such as the monetary approach to exchange rates, predict that higher growth rates in a country lead to an appreciation of this country’s currency. The figure illustrates the relationship between percent change in the yen–dollar exchange rate and growth rates in Japan’s real GDP. One striking aspect is that the exchange rate is more volatile than output. You observe that the changes in the exchange rate are much larger than the changes in output. In terms of the expected relationship between changes in the exchange rate and economic growth, some periods, such as the early 1980s, show appreciation of the yen when growth rates are higher and show depreciation of the yen when the growth rates are lower. These associations are consistent with the predictions of the theory the Monetary Approach to Balance of Payments (or the MBOP). However, when you look at the early quarters of 2010, you observe an appreciation of the yen accompanied by slower growth rates. Credit: Notes: International Financial Statistics of the IMF. cher and chrgdp indicate the percent change in the exchange rate and growth rate of real GDP, respectively. Data are available at www.imf.org. Another example of the exchange rate output relationship is the rupiah–dollar rate and growth rate of Indonesia’s real GDP. The following figure depicts this relationship. The data availability in the real GDP is the reason the figure starts in 1998:Q1. This figure is interesting because of the spike in the exchange rate, which indicates a 136 percent depreciation in the rupiah after the Asian crisis hit Indonesia (1998:Q1). The corresponding decline in output reached about 18 percent in 1998:Q4. This observation is certainly an outlier. (You call an observation an outlier if it has a much higher or lower value than the surrounding observations.) Still, it confirms the expected relationship between depreciation in the rupiah and slower growth rates in Indonesia. Although observing such outliers as a 136 percent depreciation in the rupiah is interesting, they make seeing the relationship between the exchange rate and the growth rate difficult for the rest of the available period. 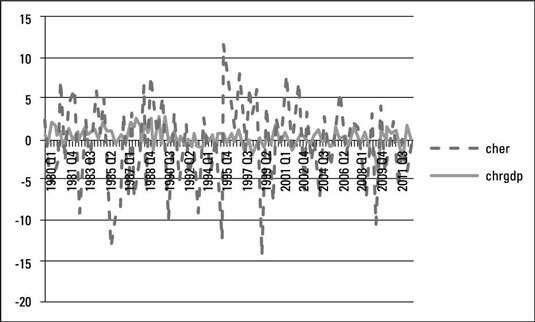 Therefore, the following figure takes out the outlier and starts with the post–Asian crisis period. 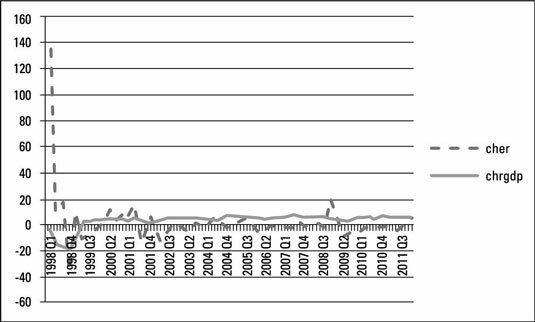 Now you can better see the changes in the exchange rate and growth rates during the post-crisis period. Again, you observe a higher volatility in the rupiah–dollar exchange rate than that of the GDP growth rate. 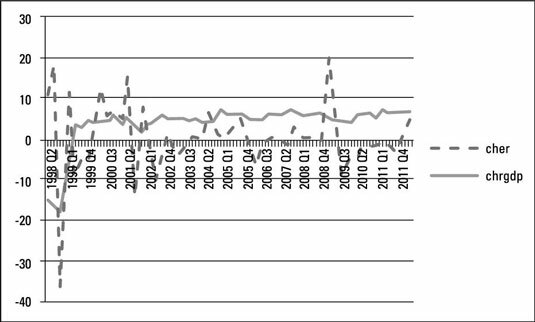 In terms of the relationship between changes in the exchange rate and GDP growth rate, the first couple quarters in 1999 and 2002, as well as in late 2004 and 2009, indicate the appreciation of the rupiah and higher growth rates. Almost 20 percent depreciation in the rupiah in the fourth quarter of 2008 coincides with declining growth rates, which confirms the theory’s expectations.